This morning in Madison, we were pulled over by a sheriff’s deputy. He used his siren and everything. The immediate reason was that Jeffrey made a left on red. He was coasting downhill in a left-turn-only lane. The light turned yellow. He waved at the people in the cars waiting at the light. They saw him in his fluorescent orange reflector vest, illuminated helmet and BikeE with flashing lights. They waited for him to make the turn. But a red light is a red light. This didn’t concern the deputy as much as the report the sheriff’s department had received earlier about a bicyclist on the Interstate. Jeffrey explained that, except for our inadvertent adventure on I-99 in Pennsylvania, we have avoided every highway that bans bicycles. The officer decided we must have been spotted on the half mile stretch of US 18 between Interstate on-ramps and the first subsequent exit, which we had taken. He told Jeffrey that his real concern was to see that Jeffrey reaches Iowa alive. He questioned our plan for a long run to Dodgeville on a 65 mph stretch of US 18. The officer said it’s legal but dangerous to bicycle on that highway’s wide shoulder. Yet he said it’s even more dangerous to take slower roads with narrow shoulders. In the end, he gave Jeffrey a business card on which he endorsed the US 18 route, in case we were stopped on US 18 by police. We’re grateful for the officer’s professionalism, understanding and advice. Yet we don’t kid ourselves: it’s likely that someone who did not “fit” here so well as Jeffrey might have had a harder time. It’s not his merit, but accidents of background and appearance, that smooth his path. and giving us gradual ups and downs on shoulders that were mostly wide, smooth, and separated from motor traffic by a rumble strip. Once on this road, it was a quick trip to Dodgeville. Three vehicles honked at us — whether to be aggressive or friendly wasn’t always clear. We saw no sign of police. In Dodgeville, when Jeffrey said, “New York, New York”, to the hotel clerk, she said, “I didn’t know New York was a town.” We never did figure that one out. We asked whether she had heard of the Brooklyn Bridge (“maybe”), if she watches The View, a program produced in NYC (“yes”), and if she had heard of the Empire State Building (“not sure”) and the World Trade Center (“yes”). Maybe she thought the New York city and state are the same thing. Or maybe she never thought about it at all. To be honest, why should she? 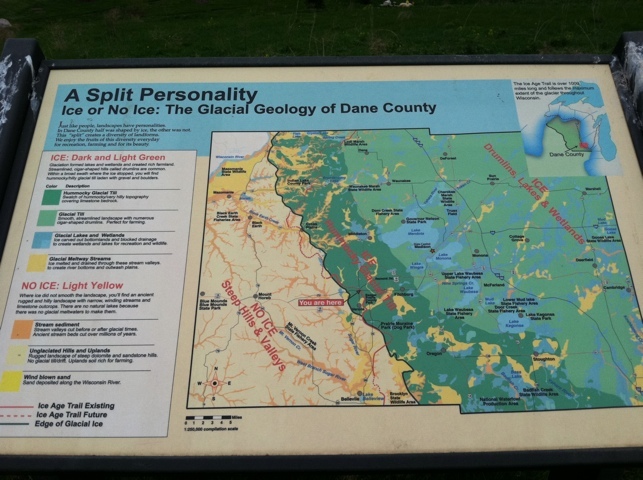 What does NYC have to do with an ordinary person’s life in Dodgeville, Wisconsin? At the cafe where Jeffrey ate dinner, people in the next booth talked about education issues. So some in these parts pay attention to the wider world, for whatever it’s worth. The server at the cafe was helpful and kind. When she heard we’re headed for Postville, she said she has gone camping there and knows people in the area. She told Jeffrey that she had worked at a factory with people who were arrested in a DHS raid; she didn’t sound sympathetic to their plight. Yet like everyone else to whom Jeffrey has explained how Human Rights First finds and trains free lawyers for refugees, she seemed to think that’s a good idea. She took this blog’s address. We hope she reads some of the Immigration Snapshots and gets our perspective on immigration laws, foreign workers, and the actual (not popularly assumed) problems of our current system. 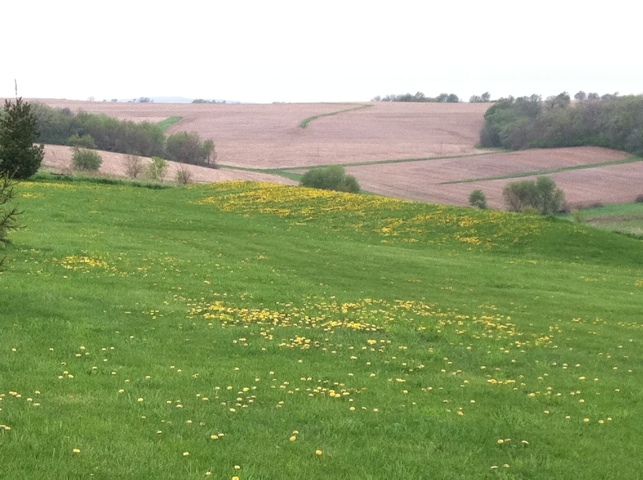 Have a look at some of today’s Wisconsin sights. Not all of Wisconsin is pristine. 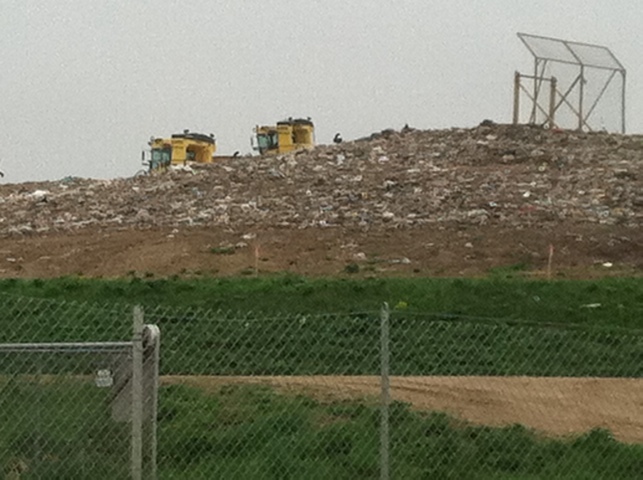 This landfill was a few hundred yards from our motel on the outskirts of Madison, the state capital and university town. But that’s OK. People make trash, and it has to be disposed of. 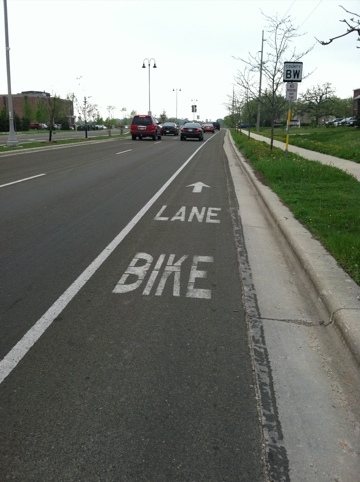 Madison has some fine bicycle routes. It’s nice to have signs proclaiming that we belong. However, in the countyside, gravel bike paths are restricted to permit holders. Some paths seemed to parallel roads we were on, but we had no permit, didn’t want to ride on gravel, and didn’t want to get lost if a path veered away from the road. We stuck to pavement. 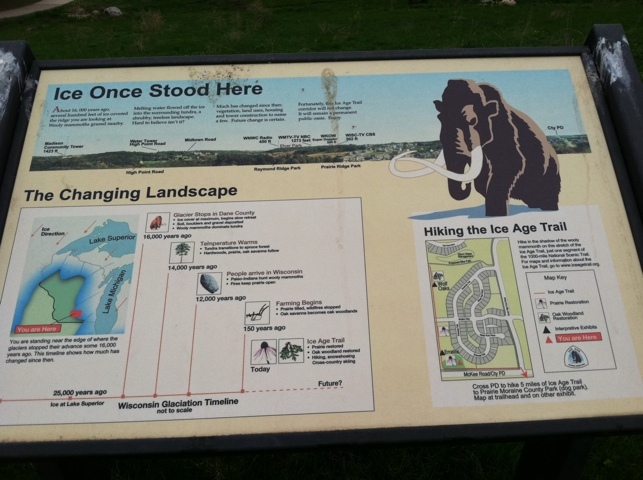 The signs below attribute the terrain to glaciers and the lack of glaciers. 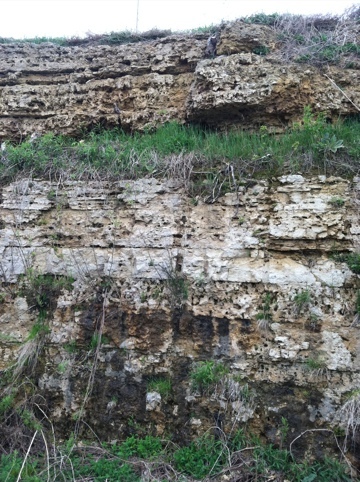 One sign says that the area once was covered by ice. Look at it now. 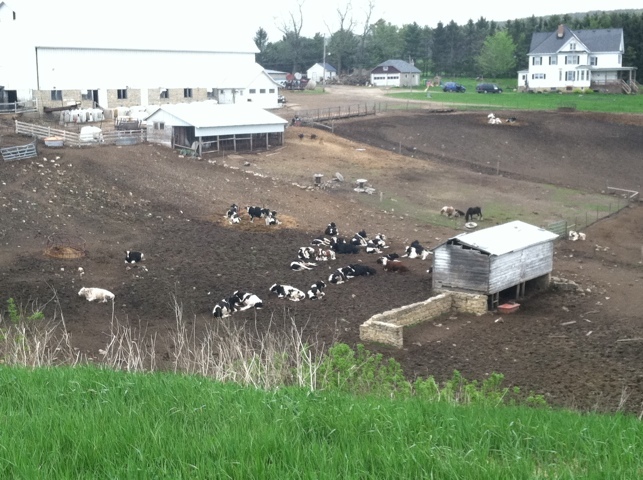 There were many pastoral scenes on the way to Dodgeville. The area reminds Jeffrey of his native northern NY. The farm buildings, the livestock, the birch trees, the lush greenery and the smells are familiar. But the soil looks richer here. All through the countryside, we heard the familiar call of red-winged blackbirds. Jeffrey enjoyed the cool air, the overcast sky (he sunburns easily — we kangaroo puppets have the opposite problem, we bleach in the sun), the feeling of freedom in the outdoors. He’ll have to readjust to NYC when he returns home. You, dear Reader, have had a tiring week. Remember that sign in Pennsylvania. Remember the sabbath, whatever that means. Don’t worry about rituals unless they move you. Take some time . . . just to be. This entry was posted in Bicycle Touring, Immigration by Joey. Bookmark the permalink. Hope nit won’t be too hard to adjust to life in the Big Apple again after being in rural America. But home is home! The Madison story is the first post I’ve read…. What an amazing journey now that I’ve gone back over some of it.. 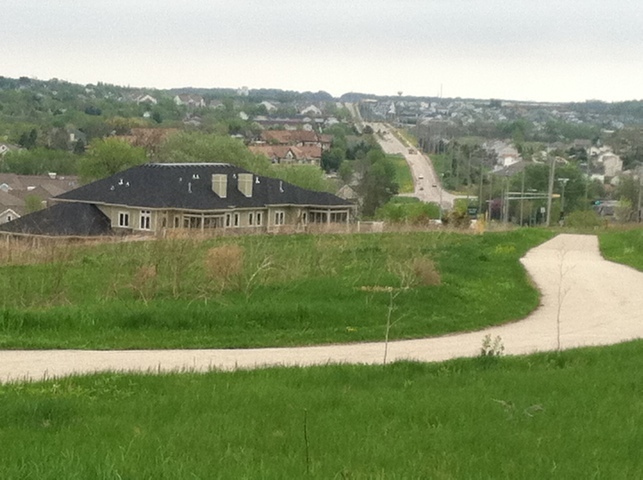 I am in awe that you in the home stretch……and congrats on making it so far and on to Postville.